Oddly enough, water can be the death of your pool cover. Counter-intuitive, right? But accumulated water from rainfall, planter drainage, hoses, snow melt, and more will weigh down your pool cover significantly putting a great deal of strain on the cover that can even lead to extreme tears. Whether you use a winter cover, a motorized cover, or a heat blanket, it is crucial to keep as little water on it as possible. This will increase the life of your cover, preserve your investment, and save you hundreds, if not thousands, of dollars in the long run. At Pet Mountain, our selection of pool cover drainage pumps features the most trusted names in the industry, including Danner and Beckett. 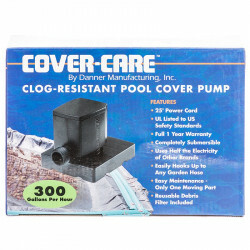 The Danner Cover-Care Clog-Resistant Pool Cover Pump is a completely submersible drainage sump pump that features only one moving part for easy operation and little maintenance. Use this efficient pump to remove water from pool covers, fountains, waterfalls, tanks & ponds, flooded rooms, and more! The Beckett Pool Cover Drainage Pump is quick, efficient, and easy to connect to your garden hose for simple water evacuation. A built-in automatic shutoff feature lets you be even more hands-off when operating this pump; just let it work while you go about your day! Whatever your pool cover drainage needs are, you'll find the perfect pump right here, and at prices that can't be beat!